There is an elegant simplicity about Francesco Linarol's solution to the problem of making a flat bellied vihuela (from which the viol developed) capable of being played with a bow, bowing individual strings rather than all of them at once. 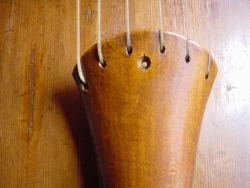 The flat soundboard was bent transversely and the two supporting bars were curved to support it. With a thicker finger-board and a higher curved bridge it provided an instrument which could be played chordally (as Ganassi describes) or hold an individual line in a consort. Evidence from contemporary accounts and paintings suggest that viols were played in consorts of the larger sizes, a typical set being what we call a tenor in 'a' playing the upper parts, two basses in 'd' playing the middle parts and a large bass in 'A' playing the bass part. They were also used as transposing instruments; the player of the tenor in 'a', playing their part as if playing a treble in 'd', the two basses playing their parts as if they were playing tenors in 'g' and the large bass in 'A' playing as if it were a bass in 'D' - thus transposing down a 4th. Ganassi and others describe this practice. Why make 'early viols' today? 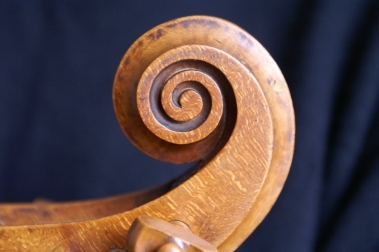 The early music revival has been characterised by exciting rediscoveries, that of the viol being one of the earliest. Thousands of music lovers have been reintroduced to the 'new' sound of this lovely repertoire though a plethora of performances on CD and DVD. For some years recorder players and lutenists have realised that if they approach their repertoire on appropriately reconstructed instruments, this has a telling effect on their production of sonority and dynamics in the music. It is my contention that earlier 16th century music suitable for viols comes alive when played on instruments made according to early principles and set up with appropriate string tension and bridge placement. There is a warmth and relaxation that reflects Castiglione's comment '...E no meno diletta la musica delle quattro viole do ario, la qual'e soavissima and artificiosa' (...no less delightful - is the music of four bowed viols, which is very sweet and artful) The Art of the Courtier. Venice. 1528.